This second WiiWare release from Bplus is a bit of a departure from their "everything-and-the-kitchen-sink" debut outing Plättchen, attempting to recapture some arcade magic via simple goals and score attacking. Whilst the presentation and controls do the job, odd choices in level design and lacklustre gameplay leave us feeling a bit underwhelmed. There's a story that ties into Bplus' first game, though it's not really important. Suffice it to say that you control Niki, a ball-shaped boy who needs to rid his village of baddies whilst collecting shiny objects. The main gameplay consists of collecting colourful pearls and eliminating all enemies in each single-screen platform-strewn environment, with your goal being to get the best clear time. You can get to grips with your choice of two control schemes in the opening menu by rolling about until you exit one side of the screen to start your game. You can either play with the default motion control scheme, holding the remote vertically like a joystick and tilting it left and right, or classic Remote-on-its-side style, using the . Though this game does superficially resemble arcade games like Bubble Bobble, we surprisingly preferred the motion controls because it works well given the central mechanic of tilting left and right to roll Niki around the levels and pressing a button to jump to reach platforms and floating pearls. Enemies come in two basic types: ones that lie about and ones that move about. Destroying enemies involves simply bumping into them or jumping on them, though there are some which will kill Niki at the slightest touch. In order to safely dispatch these he will need to pick up a power-up or the ability to change into Niki Rock: a less mobile, but far tougher form that can smash even the spikiest opponents. 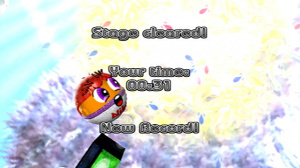 Niki will only be able to transform into rock form after acquiring a special item that's found on many levels, however the button that transforms him isn't a permanent toggle, so you'll want to remember to keep that button pressed when dangerous baddies are about and release it when you need to jump to high places. Players who've honed their platforming skills on games like Super Mario Bros. will probably find it initially off-putting that Niki controls more like a real ball than your typical platforming hero, meaning that there's no mid-air control over the character's movements. Bridging gaps between platforms requires players to build up some rolling moment up first and reaching parts of the more challenging levels can be a painstaking experience of trial-and-error. Whilst you can adjust to the control scheme and physics, getting around some of the level designs is another matter entirely. 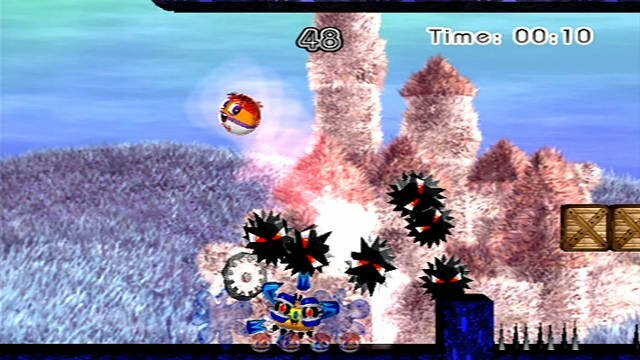 It's difficult enough trying to get to platforms sandwiched between other platforms by bouncing off walls, but trying to do something as basic as exiting the level that works like an upside-down pachinko table will really test your patience. 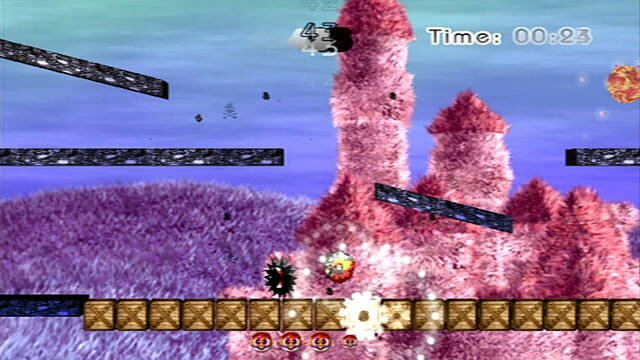 A later level in which the last pearl and a lethal enemy are right at the top of a triangle with a platform partially blocking access led us to wonder if perhaps the attempt to create a more challenging experience had gone too far. The fact that you don't always start levels in the same place and sometimes begin in close proximity to enemies who will kill on contact also presents an "interesting" design choice. Needless to say if your life is currently free of frustration, this game will leave you with some to spare. If you're unable to clear a level in three minutes the screen starts to fill with an orange liquid that Niki will float on in ball form, however you'll also have less control over his movements, so don't count on this to help you overmuch on levels where getting to the top is a problem. You can easily get trapped under platforms, requiring a rock transformation and time-consuming rolling along the bottom to extricate yourself. After a minute the liquid will reach the top of the screen and reset the level to the beginning along with losing you a life. If you lose all five lives you'll have to start from the very beginning of the current "world," as you'll only get to replay individual levels once you've completed all ten in any given world. Visually, Niki Rock 'n' Ball is a bright and colourful game. 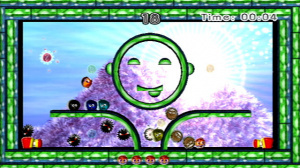 Niki looks a bit weird being a ball with hair and round, expressive eyes, but he and the enemies are cute enough. As with other Bplus games the soundtrack is the strongest feature: a light and airy score featuring plenty of pan-pipes; giving the false impression you're going on an easy-going romp collecting colourful baubles. You won't need to play too long to learn that isn't the case. Whilst the addition of a second player for co-op play could potentially make things easier, you'll be sharing the same pool of lives and therefore the frustration as well. 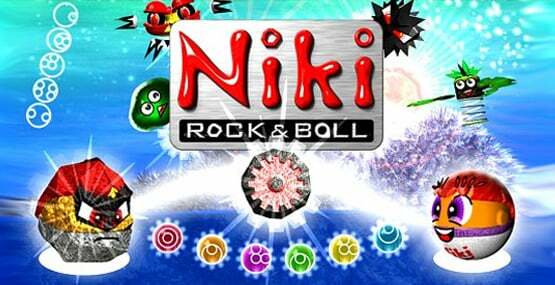 Niki Rock 'n' Ball tries to give us a bit of old school gaming fun, but it comes up a bit short. Whilst the novel control scheme works, the decision to use more realistic physics doesn't combine well with the often difficult levels on offer. Whilst we're sure some platforming fans will be able to enjoy this game, we feel it's just too frustrating an experience to make it a recommended purchase even with the low price point. Just from the description, this sounds a lot like a Stafi style game. The Stafi games are some of my all-time favorites, so I'll have to give this a try when it comes to the US. I agree with IGN and NWR on this game though, it's a terrible failure in all respects. The very basic goals are tedious and boring, the complete lack of air control makes precision platforming a nightmare (especially in that cross-shaped level where failing one jump means falling to the bottom again). No, IGN's score isn't fair either. This game is worth a 3/10 and I think I'm pretty generous with that score. The game is pretty close to unplayable. I'm serious, the controls are beyond terrible, the graphics are awful and the game just isn't fun to play. Also, you can finish this game within 2 hours.